How might we create a sustainable dust protection with optimized user feedback? During my compulsory community service at the Red Cross Austria I got to know how many people are suffering from a respiratory disease. A lot of these diseases are related to dust and lack of needed protection. Human Centered Design strategies were used during research to get to know the user and the different dust masks. Cyclone Mask 1 is a safety respirator in combination with a cyclone separator. A RFID app system provides feedback to the user and the status of the used filters. So the user knows when to change it and how contaminated it is. Due to the cyclone separation and the RFID app system the filters provide a longer life cycle and lower the ecological footprint. The whole mask is designed to make the user aware of the current contamination and always provide constant feedback. Thereby it provides a learning effect to the user. Cyclone Mask 1 honored at three different design competitions. CM1 got the National Runner Up at the James Dyson Award 2016, Bronze at the A'Design Award 2017 and was Finalist at the well known IDEA, International Design Excellence Awards 2017. User don't have any infromation about the filter status. The filters aren't long lasting and durable enough. Current solutions bring high waste production with it. A in depth user research was the foundation for this project. Interviews with construction workers, questionnaires and a field trip were conducted. During field studies three major insights were gathered. Current solutions don't have any feedback for the user. People often complain about the durability of the filters mostly because they are not long lasting enough. the last thing which was discovered was the waste production. Current solutions incorporate a lot of waste since they don't have feedback people change their filters on their own discretion even though they are only half through. For reducing the waste production a pre filter system is integrated in the mask. The pre filter system is a cyclone which separates big and small particles. This means the filters don't get contaminated so fast and are more durable and long lasting. user don't have to change their filters that often because only fine dust particles will end up in the filters. During inhaling the air gets guided through different filter systems. First it is guided into a cyclone. There the big particles will be separated from small particles. Big particles are particles which are visible with the eye. After this the air gets filtered with a fine dust filter. During exhaling the air gets guided through a a exhale vent to an exit on the left side of the mask. The guidance of the exhaling airavoids foggy glasses and smiliar distractions. For Color, Material & Finish the choice was to stay with neutral colors and have one color as signal color. The front part is considered as the shield and has the color white with a semi gloss finish. In the middle the main color is a dark grey which reflects stability and has a structural purpose. The finish hereby is matt with a slight roughness. All the integrated technical parts are semi gloss with orange to highlight the components. The back part is split in two colors, dark grey and orange. 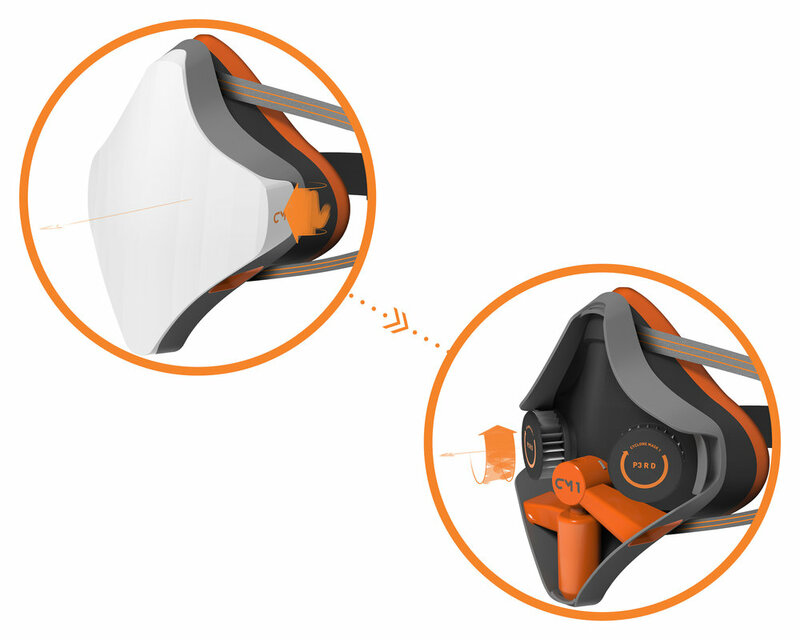 The orange part is soft medical grade silicon which should visually connect the user with the mask. The preferred production method would be injection molding. All the finish would be produced with manipulating the surface of the mold form either with etching or milling. For optimized user feedback the filters got enhanced with technology. RFID tags in the filters are sending data to an app which gives feedback to the user. The app tracks contamination data of the filters and helps the user to understand how invisible dust is. This incorporates a learning effect and brings safety. The RFID app systems decreases the waste production because people now know when to change filters and don't throw away half used filters. Each filter has two integrated RFID tags. One above the filter material with an integrated LED and one underneath the filter material with an integrated photoresistor. When filters connect to the app the photoresistor is trying to detect light, if no light can be detected. The app sends out a warning and explains that the filters are contaminated. To change filters the user can easily do that. He/she can just unclip the front piece and expose the mechanical parts. He/she then can unscrew the filter which are using a standard bayonet system. After changing the filters the used ones can be send back to the company for recycling. Cyclone Mask 1 is offering a subscription as a service. This allows a better control over the waste production and the recycling process at the same time the user always gets their filters on time and never runs out. The packaging is made out of cardboard and biodegradable polymer to keep the ecological footprint low. Cyclone Mask 1 is also responsible for recycling of their filters so that RFID tags can be reused and minimize one way products. The filter package is made out of recycled paper and the inner is sealed with biodegradable plastic. CM 1 is tracking the usage of the filters over the provided app and knows when your filters are running out. This means that the user always have enough filters and never runs out of them. Used filters can be send back with the same packaging. The first time somebody or a company subscribes to Cyclone Mask 1. They get a full package which includes the mask and two pair of smart filters. If the mask has a failure or malfunction the packaging can be used to return the item. The packaging is made out of recycled cardboard boxes and the paint is biodegradable. The first step was to conduct a ethnographic research in the construction area. Here the first insights were found and first assumptions were made to spark the creativity. After the field trip the main focus was set on dust protection because the most potential was seen there. Three interviews were taken, each of the interviewes had a different background. Here the main aspect was to get a better understanding of the user and he or she is using safety protection. 18 questionaires were filed, 15 male and 3 female people were questioned and the average age was 25. They were asked if they generally use dust protection during a dust related work. The core user needs and key findings to build a basis. After user research the prototyping phase started. Prototyping was used as an ideation tool and to test quickly new ideas about ergonomics and filter position. The aim was to look in all the parts of a dust mask and try to solve the opportunity areas. Prototyping was started at the most crucial part the strap system. Hereby a lot of different materials were used to proceed quick and fast in the process rather than sticking too long at one prototype or idea a new one was made. The mockups were tested by 10 different people. 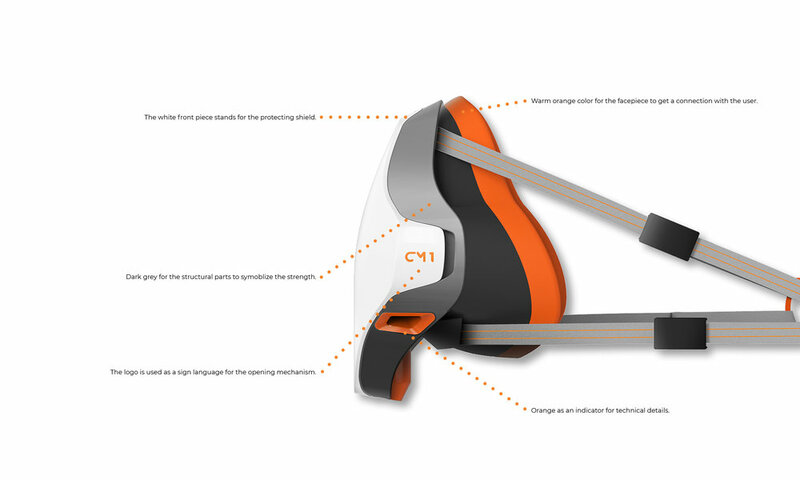 Main focus was set on usability and ergonomics of different strap systems. All the mockups of the buckle system were tested to check the usability and feasability. One big point was, if the buckle can be closed easily behind the head. The test results were used to prove my concepts and ideas. All the different mockups made in the prototyping phase. User testing to validate ergonomics. User testing to indentify the best buckle system. All the information for the perfect cyclone separator were gathered in the internet via scientific hompages and papers. Through the cyclone separation system I generated more durable and long lasting filters! At the same time I used lamella filters to minimize the size and to generate the same cross-section surface. The FDM prints were combined with one and two filters. Then tested with curry powder. The test turned out the way it should be. Big particles were separated and small particles are held back by the fine dust filter. This was the proof of concept to develop the concept further. The size of the cyclone was calculated in Grasshopper. The cyclone filter combined with a fine dust filter. The filter prototype was tested with curry powder. The formal process in this project was critical because the product will be worn in the face. Therefore the aim was to create a harmonic shape which doesn't look too much like an addon. To create the shape different methods were used. It started with simple clay models on a face mold of my own face. Than they were further developed in CAD. Later on next to CAD development different models have been printed with a FDM printer to check proportions. Pen and paper sketching together with Adobe Photoshop. Rough clay model for proportions and shape.